Cowboy Curly McLaine looks forward to the beautiful day ahead as he wanders into farm girl Laurey Williams’s backyard and sings Oh, What a Beautiful Mornin’. And that fresh-air number opens Rodgers and Hammerstein’s first collaboration together, Oklahoma! Further folksy classics like The Surrey with the Fringe on Top, I Cain’t Say No, and People Will Say We’re in Love follow as the Oklahoma! storyline, set in 1906 pioneer America, unfolds. This is the show chosen by Musical Youth Company of Oxford for its 25th anniversary production. Aided by atmospheric, panoramic set design (Gordon Fowler) and skilled lighting (Costa Cambanakis), director Chilina Madon has infused the show’s rollicking good humour into her large, enthusiastic young cast. But as awkward, simmering Jud (a strong portrayal from Arran Johnson) lumbers into view, Madon also gives due weight to the storyline’s darker side. The contrasts in mood are further pointed up by Hannah Grainger Clemson’s inventive choreography. To my eyes, however, Clemson comes a bit unstuck in the dream ballet, in which Jud attacks Laurey. The movements here seem too fussy and stylised for the rural setting of the show. In contrast, the following exuberant social dance is sensationally exciting. Throughout, company dancing and singing are pin-sharp — the accuracy and diction of the chorus singing puts many a professional group to shame. Among the solo roles, George Watkins projects Curly as a solid, thoroughly likeable guy, while Ellie Coote’s Laurey is plainly no pushover. India Shaw-Smith beautifully and humorously captures the older body language of Aunt Eller, and Charlie Watson contributes a hilarious comic turn (complete with Danny DeVito accent) as slippery peddler Ali Hakim. Becca Anthony’s charmingly naïve Ado is an excellent foil to Jake Halsey-Jones’s Will Parker. Conducted by Chris Payne, this is an anniversary production to be proud of. Oklahoma! is a curious musical. It is decidedly light on plot, there is very little in the way of character development and yet it has remained on of the most popular musicals for well over half a century. On seeing Musical Youth Company of Oxford’s production, I can only conclude that it is the glorious score that has sustained it for so long. Richard Rodgers wrote some of his best melodies for this show – and they will remain classics for all time. MYCO, as ever, have some of the best young performers you are ever likely to encounter at their disposal. Over their 25 year history, the company has nurtured some great young talent – and the current crop is well up there with the best of them. The stand-out vocal performances comes from George Watkins as Curly. Whilst he needs to learn to relax into his music, for an eighteen year old performer, he has an outstanding voice and one that will see him enter the profession once he has completed his training – of that I have very little doubt. He is well matched with his Laurie (Ellie Coote) – who possessed a very sweet tone and a touching vulnerability. Acting honours have to go to the charmingly oily Ali Hakim of Charlie Watson – who is a character actor of considerable promise. India Shaw-Smith also is excellent as Aunt Eller – it would be all too easy for her to overact a character three times her own age, but she is very convincing throughout. Director Chilina Madon and choreographer Hannah Grainger Clemson show a firm grip on their young charges – controlling the flow of entrances and exits (in a very difficult space) with great ease. They work together to provide some striking stage pictures and some crisp movement. 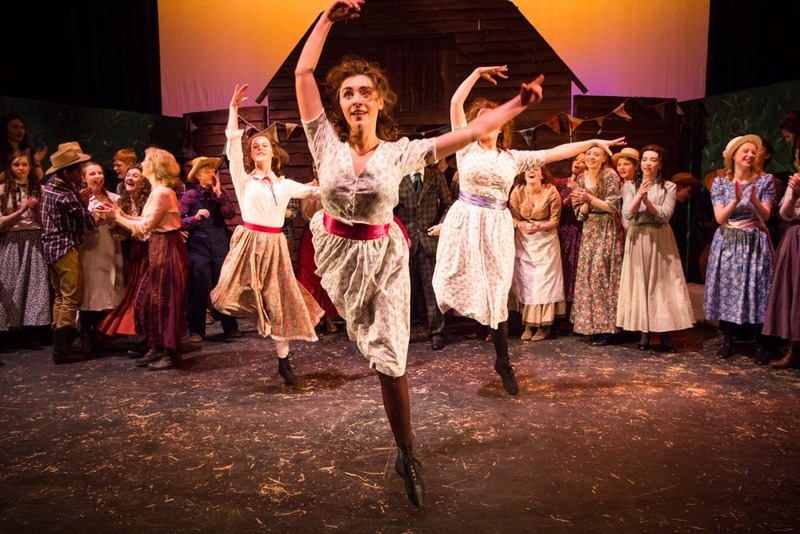 What is particularly noticeable is the high energy and commitment from the cast as a whole – it is clear that everyone on stage is fully engaged and loving every second of it. There are issues with pacing – which will clearly improve as the run continues. As is often the case with shows from that period, there is the question of the ballet sequence. Personally I would have sought to have trimmed this down – but I can fully appreciate that with the dance talent available in the cast why the decision to retain it was taken. Special mention must also go to Chris Payne and Nia Williams for their work in preparing the music so thoroughly. There are some particular fine choral moments – particularly from the female ensemble – that would rival any adult company. Oklahoma! is a dated piece – but with an energetic and dedicated cast under the guidance of their creative team, MYCO has proven that it still has a place in repertoire. And MYCO has also proven that young performers are every bit as accomplished as their adult counterparts. Here’s to the next 25 years.